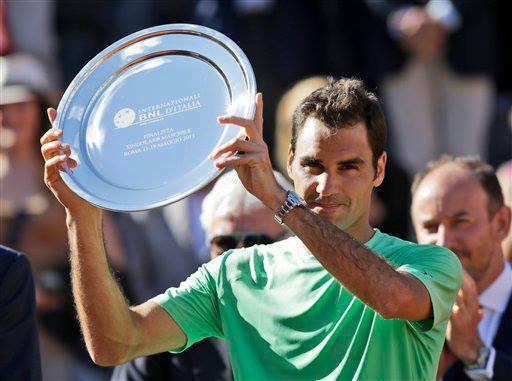 Roger Federer’s run in Rome was put to an end by Rafael Nadal in Sunday’s final at the Rome masters. The heralded King of Clay showed his tenacity, engaging in long rallies, maneuvering them in his favor. After holding an impressive opening service game, Federer would let the set slip away, piling up 15 errors as Nadal used his defensive advantage to jump out to a 3-0 lead in the second set. The Swiss was able to cut the lead only by little, breaking Nadal at love and then holding serve. However in the end, Nadal served out the match 6-1 6-3, securing the fourth seed at Roland Garros, starting May 27. Stay tuned later this week for the Roland Garros draw. See Roger Federer’s Nike outfit for Roland Garros 2013 here.